Worried you haven’t saved nearly enough money for retirement? You’re not alone. A new study by the Pew Research Center finds fewer Americans feel confident they have enough to last through retirement. While Baby Boomers worried the most about their retirement nest eggs in 2009, this new study finds those in their late 30s most concerned about their retirement outlook. 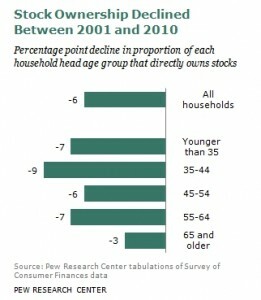 In terms of wealth, adults ages 35 to 44 were hit disproportionately hard by the Great Recession. At the same time, this age group has disproportionately failed to benefit from the Great Rebound in stock prices that began after the recession ended three years ago. The reason is that a larger share of 35- to 44-year-olds got out of the stock market between 2001 and 2010 and were on the sidelines as stock prices began to increase in 2009, according to the Pew Research analysis of data from the Survey of Consumer Finances. The S&P 500 Index peaked at 1,576 in October 2007 but then fell to a modern low of 667 in March 2009. Since then, the stock market began a steady rise, closing at 1,258 on the last day of December 2010. It now stands at about 1,450, nearly back to its earlier peak. The magnitude of these fluctuations nearly matches the collapse of the market just a few years earlier when the S&P 500 hit its previous high of 1,553 in March 2000, only to lose half its value to finish at 769 in October 2002. During this decade of wild market swings, ownership of stocks and retirement accounts, such as 401(k) and thrift accounts, fell among most age groups. But the declines were greatest among those ages 35 to 44.
occurring before 2007. In contrast, the share of adults 65 and older who directly held stocks declined only 3 percentage points from 2001 to 2010, from 21% to 18%. 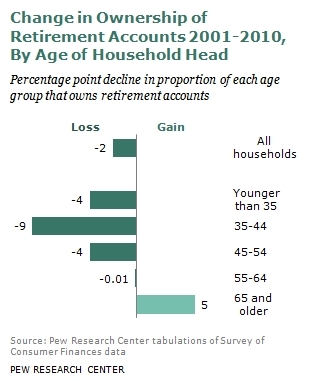 The proportion of 35- to 44-year-olds who held stocks indirectly through retirement accounts also disproportionately fell by 9 percentage points, about double the decline among those younger than 35 or between 45 and 54 years old (4 percentage points for both groups). As a consequence, those in the 35 to 44 age group have benefited less from the rapid increase in stock prices since 2009 because they were less likely than their older counterparts to own stock and retirement accounts. Pew researchers also found those with more education tended to be more confident about their prospects. Seventy-one percent of college graduates expressed confidence in their retirement finances. Among those who attended college but do not have a bachelor’s degree, six-in-ten are sure that they will be financially prepared when they reach retirement age. To read more from the Pew Center’s report, including the impact of the housing bubble, click here.